Studio Carry On Harry invited American Football League Champion Ben Troupe on its show to share his journey as a footballer and lessons that he learnt over the years from the game and life. He is surely here to inspire young minds with some golden nuggets spilled on the show episode with show host Harry Johal from Singapore. Ben Troupe, was born in Swainsboro, Georgia in 1982. He attended Butler High School in Augusta, Georgia, where he was All-American and was recognized as one of the top four tight end prospects in the Southeast. Following his senior year, Troupe accepted an athletic scholarship to attend the University of Florida in Gainesville, Florida, where he continued playing football. As a senior Gator and team captain in 2003, Troupe was a first-team All-Southeastern Conference (SEC) selection and received first-team All-American honors from ESPN, Rivals.com and Sports Illustrated. He was also one of the three finalists for the John Mackey Award, recognizing the nation’s best college tight end in 2003. He finished his college career with sixty-four receptions for 958 yards (14.9 yards per catch) and seven touchdowns. 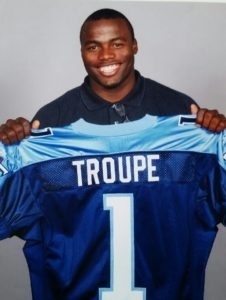 In the 2004 NFL Draft pick, the Tennessee Titans selected Troupe in the second round. He played tight end for the Titans from 2004 to 2007, and was nicknamed “Troupe Scadoop” by his Titans teammates. During his four seasons with the Titans, he made 106 receptions for 1,056 yards and seven touchdowns. Troupe a professional football player who was a tight end in the National Football League (NFL) for five seasons during the early 2000s, played professionally for the Tennessee Titans and Tampa Bay Buccaneers. As young kids often look up to athletes, both professional and collegiate as heroes, Ben knows the impotence of Athletes being a positive influence, especially those considered to be disadvantaged minorities, and those who demonstrate higher than average talents. Ben travels the country speaking at schools, universities and churches to enrich his audience of all ages. Stay Tuned for more on the show. releasing soon.